After presenting various operational assessment regarding to logistics vehicles to PT. Indonesia Kendaraan Terminal (PT. IKT) finally begins from the date of March 1, 2016 and TMMIN has handed over all operational activities of logistics vehicles to PT. Indonesia Kendaraan Terminal and no longer to third parties. TMMIN provide the full trust to PT. IKT that the quality of goods is well maintained during the operational logistics activities take places. 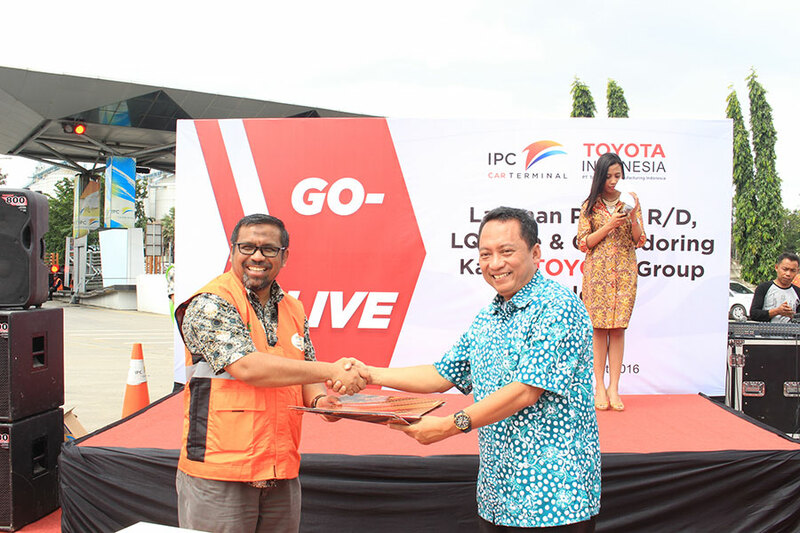 Therefore, on Friday 4 March 2016 has held the Go-Live Full Service Ceremony on Receiving / Delivering, LQ Gate & Cargodoring Cargo TOYOTA group byPT. Indonesia Kendaraan Terminal in the Port of Tanjung Priok. This event was attended by Mr. Armen Amir as the Director of PT. IKT, Mr. Ari Syamsudin as the representative of TMMIN and also several partners from PT. IKT. By helding this event ceremony TMMIN hope can participate in the conduct of Indonesian Export activity, especially in the automotive industry and strengthen the cooperation relations with PT. IKT.